"Don't worry. Thinking comes later." 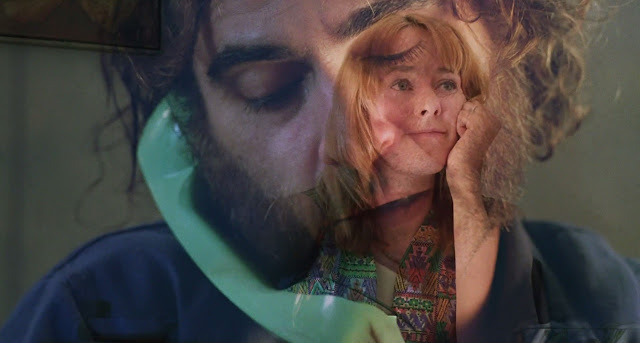 Inherent Vice is almost joyously dense and beautiful as it is incomprehensible. Adapted from reclusive author Thomas Pynchon's light yet hard-boiled, stoner detective novel, filmmaker Paul Thomas Anderson has faithfully translated the convoluted, drug-fuelled counterculture story into an energetic ensemble film full of bizarre narrative developments. Joaquin Phoenix stars as the perpetually stoned private investigator, Doc Sportello, who navigates old romances to uncover multiple mysteries and chase leads. The film opens splendidly with perfect musical cues and a sublime 1970 Los Angeles period, beach setting with Phoenix and his former paramour and flower girl Shasta, played effortlessly by the nubile Katherine Waterston, establishing the first in a series of strange, mysterious elements of nonsense MacGuffins and sense of doomed romance. Soon, many delightful yet short on screen time characters show up with all of them loosely tying together in Doc's drug-addled mind. However, the film soundly rejects any notion of a conventional plot or narrative structure with its wildly madcap turns and psychedelic asides. The talented, sprawling supporting cast of Owen Wilson (as an informant saxophonist ex-junkie on the run), Reese Witherspoon (a buttoned up Nixon-like assistant DA and Doc's casual lover), Benicio del Toro (a dopey maritime lawyer), Hong Chau, Jena Malone, Martin Short (a drugged out dentist and conspirator), Eric Roberts (as Mickey, Shasta's married lover and real estate tycoon, whose disappearances sets the film in motion), a series of neo-Nazis, Aryan bikers, cult members, and singer Joanna Newsom (as the narrator) show up to propel the wild series of loose stories together. Of particular note, the scene-stealing Josh Brolin as a straight-laced yet loud detective with a crew cut (nicknamed "Bigfoot") is absolutely terrific and stands out with a towering, engrossing performance. He shows up at every corner to foil Doc's investigation (as the ying to his yang). His frustratingly lessening power, as we move into the 1970s, is juxtaposed with Doc's meandering competence and influence. Anderon's usual collaborative cohort, Oscar-winning cinematographer Robert Elswit, is at his best with a bright, California sun-kissed visual palette. It does wonders to establish the hazy, moody look and feel of pot smoking beach bum vibes, just as composer Jonny Greenwood's dreamy score sets the scene. Anderson has made a densely fluid yet simultaneously baffling labyrinth of a film about a very specific time and place as a cinematic mixture of his previous works (think Boogie Nights mixed with The Master). The atmospheric mood and ambience is spot on as the Pynchon dialogue, moments of enlightened comedy, and dramatic candour lift the impossibly hard to follow yet amusingly senseless plotting. It's a remarkable achievement of acting and literary adaptation, flowing every part of the novel with cinematic flourishes and precise editing. It's a sublime mood piece of ensemble filmmaking with subtle sociopolitical commentary. Only PTA could get away with such a charming mess of a film as he makes (very) loose enough sense of Pynchon's material.